^ 1.0 1.1 Seligman, Katherine. 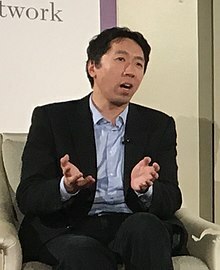 If Andrew Ng could just get his robot to assemble an Ikea bookshelf, we'd all buy one. SFGate. 3 December 2006 [12 February 2013]. ^ Claire Miller and Nick Bilton. Google’s Lab of Wildest Dreams. New York Times. 3 November 2011. ^ 陈粲然Ray. 吴恩达：Google人工大脑背后的那个人. PingWest. 2013-05-10 [2014-05-16]. ^ Jenkin Xia. 淡出Coursera，Andrew Ng的下一站是百度. PingWest. 2014-05-15 [2014-05-16]. ^ 雷建平. Google Brain之父加盟百度任首席科学家职务. 腾讯科技. 2014-05-16 [2014-05-16]. ^ A personal message from Co-founder Andrew Ng. Coursera blog. 2014 [May 16, 2014]. ^ pening a new chapter of my work in AI. 2017 [May 16, 2014].